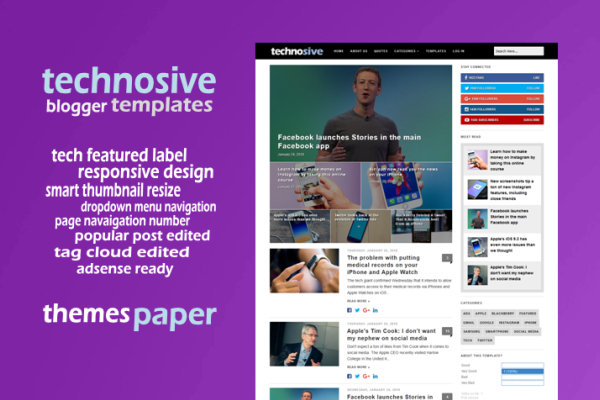 Technosive is responsive blogger template for tech review. Technosive is a simple, clean, modern and professional blog ideal for making a professional blogging and elegant websites. This template is totally responsive so it adapts to your style as well as the device it’s viewed on. It is clean and fresh style and high user friendly blogger template. Technosive created by Herdiansyah Hamzah and published on this site. Technosive features include responsive design, tech featured label, smart thumbnail resize, responsive dropdown menu navigation, label cloud edited, feedburner subscribe, page navigation number, popular post edited, white color background, comment edited, standart SEO ready, share social media button on homepage/postpage and well documentation on PDF version. Technosive is free template from Themes Paper, but you can choose premium option Only $5, has advantages such as you can remove footer link credits, no encrypted scripts, uncompressed CSS, you can use for unlimited domain, you will get lifetime templates updates and lifetime premium support from us. You can buy this premium version with PayPal button below and please confirm to please confirm to themespaper [at] gmail.com after transaction. Nice template. Looks like worpdres themes. Thank you for share. Thank you Mr. Anonymous. Please leave your name and blog adress. Nice work. This is best blogger theme. I loved this. Superb! God bless u sir. Thank you Arun, hope you enjoy it. If you have any feedback, please leave a comment or email. I do not understand. Can you use english, please? Thank you. Belum, masih standar. Akan diupload versi updatenya.